Following on from the successful show in 2006, this is an exhibition of alterNATIVE perspectives held in response to the 6th Asia Pacific Triennial at QAG and the QGOMA, in Queensland, Australia. the other APT features a range of artworks from Australian-based artists from various cultural backgrounds and artforms: Aboriginal, Torres Strait Islander, Australian South Sea Islander, Fijian, Maori, Tongan, Samoan, Vietnamese, Chinese, Filipino and more. launching online from December 1, 2009. Curated by Jenny Fraser. The first solo exhibition by Brisbane based multi-media artist Chantal Fraser. Conjoining the annals of travel and tourism, this series shapes the parochial views of the tourist as subject. 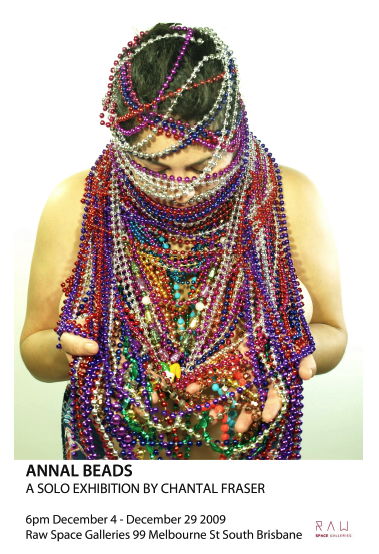 A series of performative frames showcase a collection of neckpieces (Ula) from the artist’s Samoan family – gifts of significance, ceremony and value – alongside a collection of metallic beads thrown from the balconies of Bourbon St, New Orleans during Mardi Gras– an herogenous ritual that rewards the female tourist more beads on the exposing of breasts. Reinterpreting the significance of adornment the artist presents and plays with the disparate meanings of what it means to receive such objects from these heavily tourist promoted regions through flamboyancy, titillation and parody. Annalise is an awesome multi-talented woman, whom I was lucky enough to meet at the Big Island workshop at University of Wollongong last week. Check her website and blog and look out for her performances and workshops. 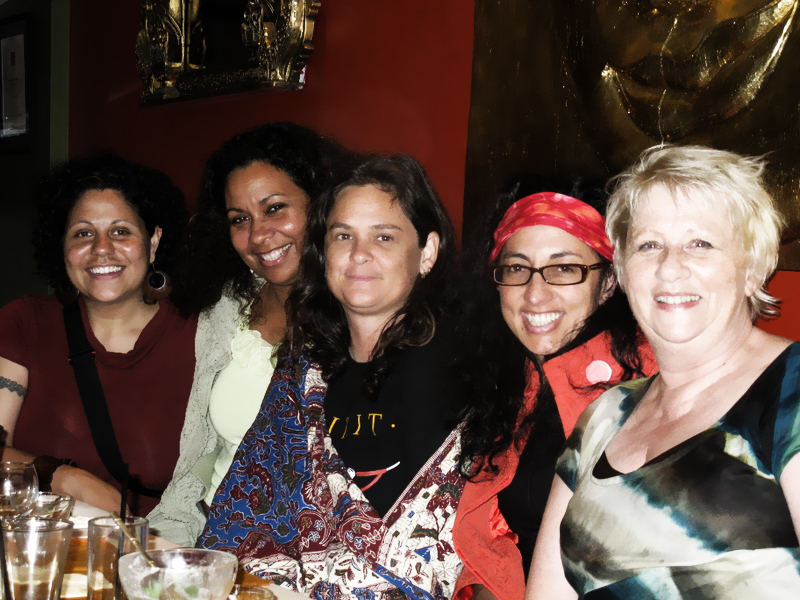 A workshop intensive to share research and pool ideas related to the discussion and promotion of contemporary Pacific arts in Australia was this week hosted by the Centre for Asia Pacific Social Transformation Studies at Wollongong University. Australia, the Big Island in relation to the Pacific, generally looks to New Zealand when seeking to represent contemporary Pacific arts practice. Artists from smaller Pacific islands may be granted the occasional look-in, the workshop suggested, while Australian-based Pacific content is largely appreciated as ‘decoration’, with an emphasis on community- and tradition-based performance. The University currently offers a range of courses leading to majors in Pacific Studies and Samoan Studies in the BA degree at undergraduate level. The BA (Honours), and MA in Pacific Studies and the PhD in Pacific Studies are offered at postgraduate level. The Director will provide academic leadership and strategic direction for Va’aomanū Pasifika. This position will enhance further the research culture, postgraduate development, and research-led teaching of Pacific Studies and Samoan Studies at Victoria University. The Director must also develop and maintain external networks and effective working relationships with Pacific communities and stakeholders. Applicants should have a PhD and an excellent research and teaching profile. A background in social sciences and a proficiency in a Pacific language would be an advantage. The appointment will be made at Associate Professor level.